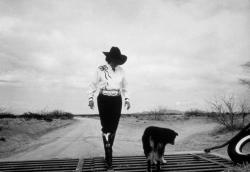 From Evelyn Fite Tune’s famously monogrammed cowboy boots to Fern Sawyer’s irrepressible spirit, Ranch Women of New Mexico celebrates an icon of the American West, from a female point of view. 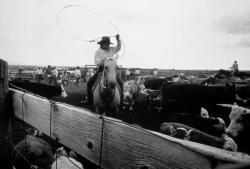 Featuring 11 women who have “cowgirled” or owned ranches in New Mexico, the exhibit represents selections from work by photographer Ann Bromberg and writer Sharon Niederman. The photos will be on display in the Mezzanine Gallery, joining the History Museum’s celebration of Women of the West this summer. The celebration’s main exhibit, Home Lands: How Women Made the West, will be on exhibit June 19-Sept. 11 in the second-floor Albert and Ethel Herzstein Changing Exhibitions Gallery. In Bromberg’s black-and-white photographs for Ranch Women, the often-underestimated role of women in the West comes to life. The photos reveal their dynamic contributions to the environment, their multicultural families, and their economic survival in a "boots on the ground" way of life. Evelyn Fite Tune. Born in 1919 to Saskatchewan pioneers, Evelyn grew up near Magdalena, NM, during the Depression. In the early days of her marriage spent ranching outside Socorro, she had no running water or electricity. “I was a ranch wife. You do everything. If you have to move cattle, you get up very early. That’s what all ranch wives do. It was hard, a lot of hard work, but it was good work.” Her philosophy of life was on a sign that hung above her doorway. “No Sniveling,” it read. Fern Sawyer. 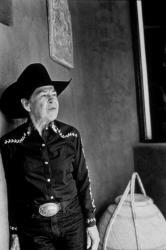 A women’s rodeo pioneer, Fern was named National All-Around World Champion Cowgirl in 1938 at Madison Square Garden. 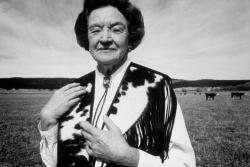 Inducted into the Rodeo Cowboy Hall of Fame, Cowgirl Hall of Fame and National Cutting Horse Hall of Fame, she was as known for her glamor as her pipe smoking and cussing. Fern passed away in 1993, in the saddle, with her boots on. Mary B. Davis. Manager of the horse breeding operation of the Crow Creek Division of the CS Ranch, this daughter-in-law of legendary cowgirl Linda Davis grew up on a Waynesboro, Ga., ranch. 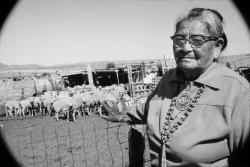 A member of the younger generation of ranch women, she carries on the traditions of ranching life with her husband, Warren Davis, in New Mexico. Download high-resolution images of these women by clicking on "go to related images," below.